MiR (Mobile Industrial Robots) produces the MiR500, MiR200, and MiR100 mobile robots for automated, efficient and safe plant transportation. 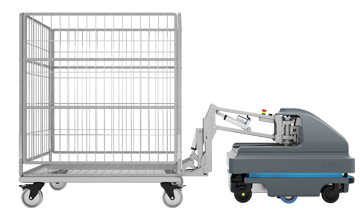 Ideal for small transport tasks in manufacturing, logistics and healthcare industries, the MiR100, 200, and 500 optimize workflow and reduce in-house transport costs while maintaining safety in the plant, with payloads up to 1,100 pounds. 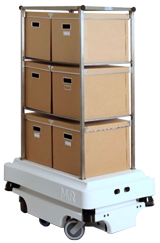 The reduction of manual transport and delivery times by the MiR100 frees up staff resources and increases transport task efficiency. The advanced mobile robot requires no structural changes to the building, and operates safely and smoothly through doorways and in and out of lifts. It offers simple and user-friendly operation via PC, smartphone or tablet, and typically results in a payback time of less than a year. T he MiR100 is equipped with 2 scanners and a 3D camera to ensure safe maneuvering around workers and obstacles. When encountering an obstacle, the robot quickly alters its route – automatically slowing down, driving around the obstacle or stopping. If you are located in Kansas, Missouri or Illinois, contact HTE Automation for all Autonomous Mobile Robot needs, or to learn more about the efficient mobile transport robot.